Participants of the annual cross-country endurance run traverse 497 kilometres across the 7 Emirates over the course of 7 consecutive days to raise funds for children with limb deformities or amputation under the slogan ‘get children back on their feet’. 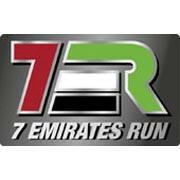 7EmiratesRun was founded in 2010 by Wendelin Lauxen, holder of Guinness World Record for ‘Fastest time to complete a marathon on each of the 7 continents’, who ran 575 kilometers solo across the UAE in 12 days. Well done Angus. Great job./ Sorry for the delay. Totally swamped at work! Brave. Insane. Brilliant. Such an inspiration!! Thank you for supporting Al Jalila Foundation. #TeamAlJalila’s first marathon-running-gorilla. Great cause, crazy idea, love it! Run gorilla, run! Good luck and all the very best. Take some deodorant with you if you run in the suit!! You're mad. Best of luck.